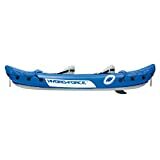 Hydro-Force Ventura Kayak 130" X 37"
People who want to enjoy the great outdoors might want to go paddling across a lake or down a gently-flowing river. Or maybe they want to go through whitewater rapids. Inflatable kayaks are a great idea—they don't occupy as much space as a hard shell kayak. They can be carried along in a carry bag and packed away for the winter months. They are actually preferred in a rapid river (whitewater) setting. This is because they don't get dented when hitting rocks in the water, and instead bounce off. Here is a guide to some of the best inflatable kayaks on the market. Enclosed Design: A kayak with an enclosed hull has a snug cockpit to keep wind and water out. They have a coaming—a raised structure around the cockpit of the kayak, to keep out water. Some coamings also allow you to attach a spray skirt—a type of cover that attaches you to the kayak and keeps out water even more. The enclosed design is better adapted to cold and windy weather. Open Design: An open-design kayak has higher walls than an enclosed kayak, in order to prevent water from entering. Open design kayaks are preferable in some situations because you can adjust the seating, and there is more space to put equipment. With an open design, you can adjust a kayak made for two or more people into a kayak for only one by removing the other seats. Also, some are equipped with a spray deck, which converts it into an enclosed kayak. Sit-On-Top Design: In the sit-on-top design kayak, the walls of the kayak are low. This type is best for warm weather, when you don't mind getting wet (or might just want to cool off). Inflation Pressure: Some kayaks are supposed to be inflated to high pressure (from 3-6 psi), and some to low pressure (1 or 2 psi). Low pressure kayaks will tend to be less expensive. The larger the kayak, the higher the pressure to which it must be inflated. That's common sense: since it's a bigger volume, it requires more air. High pressure kayaks will have drop-stitch construction, where the top and bottom layers are stitched together along the length, to hold up under higher pressures. They will sag less, and be easier to paddle. Portability: Because they collapse down to a small size, they can be carried around while hiking, or transported in the back of your car. Otherwise, for a solid hull kayak, you would need a roof rack to tie it down to the roof of your car. Weight: The inflatable kayaks are usually lighter in weight. Some are less than 10 pounds. But if you'll be in windy conditions, a lightweight kayak might not be so easy to carry around. And if you want to carry gear or more than one person, the kayak should weigh more—somewhere between 35-50 lbs. Number of seats and legroom: If you are tall, then you'll want to allow more room for your legs. Also, check the capacity of the kayak (how much weight it can sustain without sinking in the water). A two-seated kayak can hold up to 500 lbs. 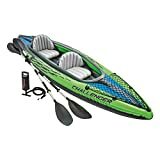 Amount of gear that you want to carry: What are your plans besides kayaking? Maybe you'll be camping, fishing, or scuba diving. 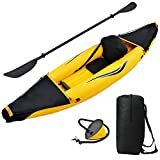 If you will be carrying a lot of gear with you, try to look for a kayak with special compartments to hold accessories. 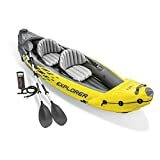 Another option is to buy a two-seated kayak, and put the gear in the empty seat. That will also make the kayak more balanced. Weather conditions: If you'll be kayaking in cold weather, you'll want an enclosed kayak that has a coaming, and you'll want to attach a spray skirt to keep dry. If you'll be kayaking in hot weather only, then you can allow yourself a sit-on-top design. Inflation: Remember that air contracts in cold weather and expands in hot weather. A high pressure kayak will have to be inflated more in cold weather, because the air inside will contract. A kayak that felt fully inflated before going in the water will lose pressure when it hits the cold water. And when it's hot outside, release some of the pressure in your kayak. Sea Eagle-- is an American company started by Cecil Hoge Sr. in 1968 in Port Jefferson, New York on Long Island. 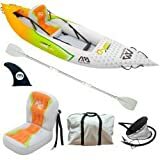 Their first product was a two-seated inflatable kayak. They have since expanded to fishing boats, paddleboards, motor boats, canoes and boating equipment. They have a wide range of kayaks, from kayaks for recreational use to kayaks for expeditions. Advanced Elements—is a company based in Concord, California that was founded in 2006. Their innovation was in trying to make an inflatable kayak that also included features of a rigid kayak, but still was portable and lightweight. They currently feature over 70 different types of inflatable kayaks. Intex Recreation Corp.--is a company based in Long Beach, California. They have made above-ground pools and water recreation products since 1975. 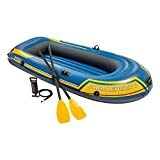 They make inflatable boats for both sporting and professional purposes. Sevylor is a company based near Lyon, France. 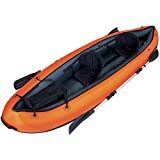 They make a wide range of inflatable canoes and kayaks for fishing and recreation.